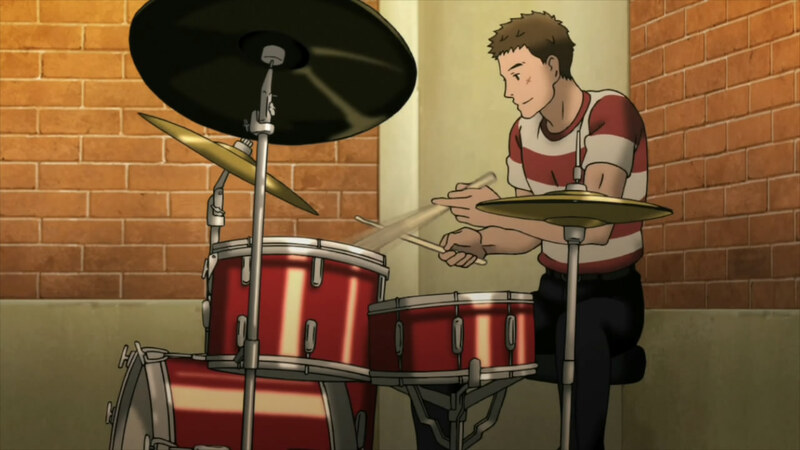 As Aftershok has seemingly had a mental breakdown from the lack of jazz in Sakamichi no Apollon’s episodes as of late, allow me to take over while he recovers. The one thing to keep in mind is that this was written before I had seen episode 7, so do keep the criticism of a certain rendition in episode 6 in mind as something solely confined to episode 6 and not 7. A new school year, brings with it a new start. An empty slate. Where past grades don’t really matter too much and students have the ability to shape their destinies however they wish and pave a path that will take them where they need to go. At least, that’s the sort of rose-colored glasses I bring with me for the first week of classes until the laziness sets in! But advancement we have, as Sakamichi no Apollon’s character relationships look ripe for advancement. 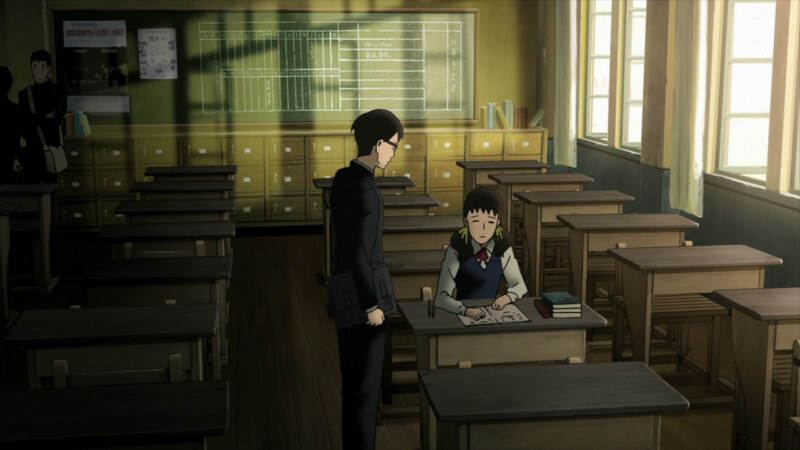 The first portentous statement comes in with Sentaro telling Ritsuko to look over Kaoru. Of course, at the time this is spoken, we’re not sure if it’s because he wants to help Kaoru get together with Ritsuko or something else entirely. I certainly didn’t think it was a harbinger of the events that’d happen at the end of the episode though. An unknowing act of foreshadowing perhaps. Or maybe it’s all as planned. In any case, with Kaoru’s outburst towards the end, the series has now added jealousy into the melting pot of Apollon’s emotional drama. The only part that’s missing from all this is the music. If anything, the last couple episodes that Sakamichi no Apollon have graced us with has gotten us more invested in the characters and the situation they’re in. The only unfortunate part in all this is that the music is playing third, maybe even fourth fiddle to the plot and characterization. I had hoped that the music would be more closely tied to the story, like jazz being a metaphor for Kaoru’s growing acceptance towards unexpected events or how he’s better able to improvise despite being thrown into novel situations. That it’d serve as the invisible character that nevertheless exerts a great deal of influence on what happens in the course of the story. As is, the use of music in Apollon has left me feeling rather wanting. 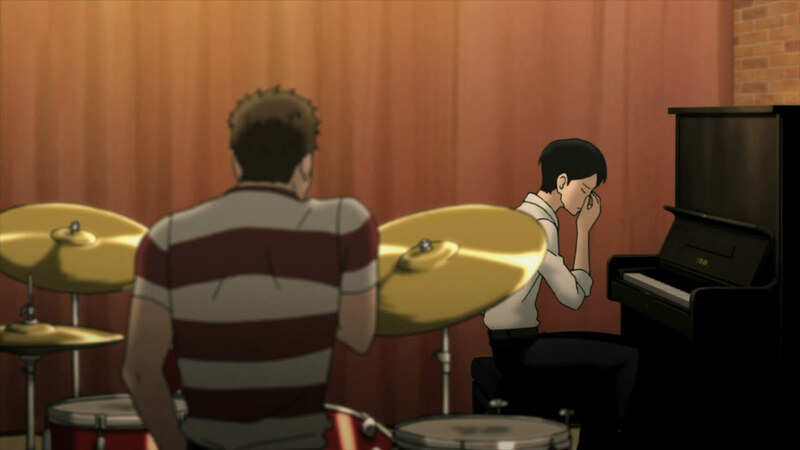 Which isn’t to say that the show as a whole isn’t good, but melding together the jazz with the story like what Nodame Cantabile was able to deliver upon with classical would have been a nice touch. So what we have, is that episode 6, like the one before it, is rather sparse on the musical front save for the mention of Rodgers’s and Hammerstein’s “My Favorite Things” from The Sound of Music. “My Favorite Things” would eventually get new life breathed into it through John Coltrane’s jazz rendition where he shifts over from bebop to modal jazz and use, of all things, a soprano saxophone (courtesy of Miles Davis) to play the main melody (the soprano saxophone and the piano switch off with the solos). It’s certainly not an instrument you’d find a lot of in jazz pieces, but in the midst of Coltrane’s explorations in instrumentation and harmonic reworkings of popular songs, this bit of experimentation bore fruit and My Favorite Things, the namesake album that Coltrane released, would go on to become popular and ultimately win a Grammy Hall of Fame award.